In preparation for my last fight, my training was pushed up a notch further than it ever had been before. This involved doing a lot more clinching than usual. Clinching is probably my favourite part of training and something I really, really enjoy. I feel as though I learn something new every time I do it. Kru Singh had me doing around 30 minutes of clinching with him every day, which I loved. When I mentioned this to Sylvie von Duuglas-Ittu over Facebook, she immediately offered to come to Master Toddy’s to train with me, specifically to help me with clinching to get me ready for my fight. It was a really generous offer, one that I knew would really help me. I get a lot of clinching at my gym, but not with anyone my size, as all of my training partners and trainers are far bigger than I am. It doesn’t cause me a problem, but there is a lot to be learned from working with someone your size. It can drastically change the way certain holds or techniques work and the angles that you have to use. Not only that, but Sylvie is a clinch machine. She has always been a knee fighter, but since she began training with Phet Jee Jaa at O. Meekun gym, her clinch has improved dramatically. In fact, it’s won her almost every fight since then, and she’s been stopping most of her opponents early with knees. There is definitely a lot I can learn from Sylvie, and it was wonderful that she was so keen for me to do so. It’s great to know other female fighters who are so eager to help each other out – that is something really special. Plans quickly came together for us to train together a week before the fight, a session that Sylvie dubbed ‘the clinch soirée 2014‘. How lovely. Sylvie came along to a Friday afternoon session with a friend named Michelle, who was flying out of Bangkok’s Suvarnabhumi Airport the following morning. We got straight into some sparring, which was a lot of fun. Sylvie’s size, along with her huge amount of strength and experience, made her a great sparring partner for me and she challenged me in ways that I’m not usually challenged with my day-to-day sparring partners. After sparring, we did a couple of rounds of bagwork and got straight into clinching. I wanted to get as much time as possible to work with Sylvie on that before she had to go, so skipped the padwork. Interestingly, a lot of things that I am usually able to execute very well with my other clinching partners, I wasn’t able to use with Sylvie. This was mainly because she was so fast. At times, even when I saw my opening and knew exactly what I needed to do, she would neutralise the clinch before either locking me, turning or throwing me before I could actually do it. She didn’t just come to the gym to throw me around, though (contrary to my trainers wishes. They were quite excited by the idea of her beating me up!) She also took the time to go through some individual techniques with me during the session to fill some of the gaps that I had. ‘Even though they are in the land of great technique Thai girls actually can have a very hard time learning to clinch as there are social boundaries against a male placing the face on the neck, it can be very intimate, as well male and female bodies generally being so close. This is not to mention the very male space of most Thai clinch practice. Thai girls that excel in clinch have usually been taught by family members like Phetjee Jaa has’. After training, we went for dinner and agreed to have another similar session soon. I woke up the following day feeling as though I’d been hit by a train, everything was sore – which just goes to show how differently I was challenged by working with her. I was also brimming with ideas. Our session had brought a lot of things to my attention and I felt that if I could just work with her again the following day, I’d be able to make a lot of progress with them. This is why we’ll have to do it again. 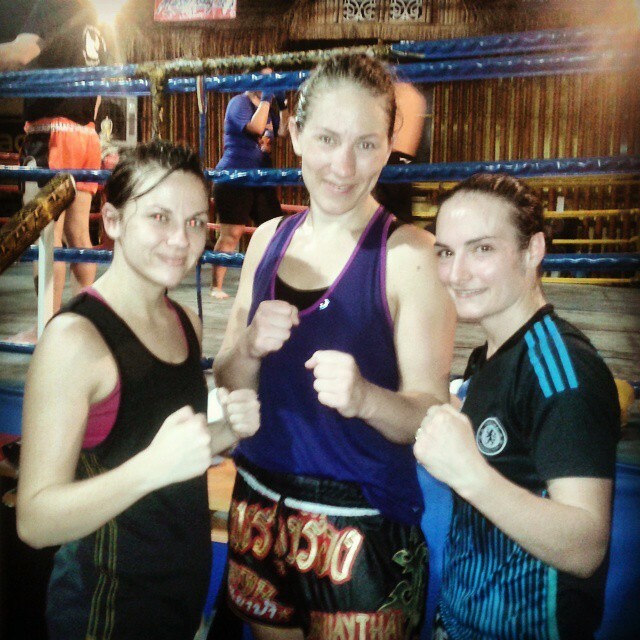 Next time, I plan to make the trip to Pattaya to train with Sylvie to return the favour. Besides being able to learn a lot from working together, it’s great just to be able to connect, share our experiences and support each other. If anyone else wants to join another ‘clinch soirée’ in the future, do let us know! I’m always happy to make more connections like this one. Me, Michelle and Sylvie at the end of our training session. Here are a few more pictures of our clinching session, taken from Sylvie’s Facebook page. This entry was posted in Training and tagged Clinching. Bookmark the permalink. i could tell you a bunch of clinch things. but i`ll take a pass this time . Thank you for posting this! I am also very inspired by Sylvie, she helped me overcome certain thing mentally. I am going to make training in Thailand a reality, hopefully in 2016, probably will be able to stay for a month or more. I would love to connect and learn from you all. That would be great! Do let us know when you’re coming. Maybe we can all train together!